How Are Depression and Alzheimer's Disease Connected? Most health conditions seniors develop have direct links to other ailments that often have simpler remedies. If your senior loved one is experiencing depression, for instance, he or she may be at a high risk of developing Alzheimer’s. Harrisburg caregivers discuss some of the connections between the two disorders to provide a better understanding. 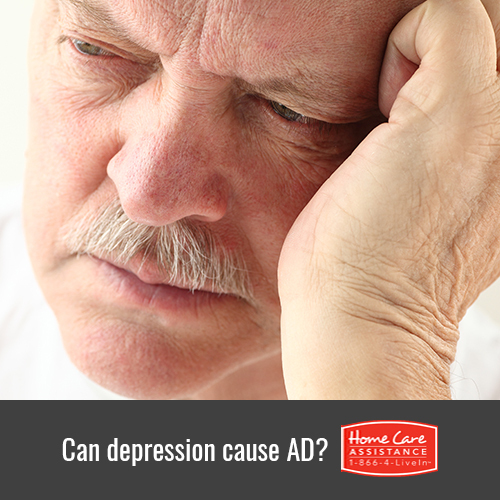 Depression causes seniors to stress over various situations, especially things they cannot control, such as aging. When your loved one becomes depressed, he or she will begin to produce large amounts of the hormone cortisol. This hormone is responsible for impairing areas of the brain that impact learning abilities and short-term memory. Once stress hormones are released into a senior’s brain, it causes a rapid decrease in thinking and memory skills. The more depressed your loved one is, the higher his or her cortisol levels will be, which is toxic to the brain, causing confusion. These stress hormones prevent your loved one’s brain from functioning normally, and Alzheimer’s may develop as a result. Issues like the loss of independence and the need for medical care can cause depression, which may lead to chronic inflammation in the brain. The blood vessels in the brain become damaged, which leads to memory loss and other cognitive impairments, often triggering Alzheimer’s disease. What is good for the heart is equally good for the brain, including the food your loved one eats. When your loved one becomes depressed, he or she may begin to eat more, especially unhealthy foods that raise cholesterol. High cholesterol levels reduce the blood supply to the brain, which can impair cognitive function and lead to Alzheimer’s disease. Failing to eat healthy may prevent the brain from functioning normally and impair your loved one’s memory and thinking abilities. There are many potential solutions to help alleviate a senior’s depression and prevent cognitive decline. One way to help is by hiring a professional caregiver. At Home Care Assistance, all of our caregivers are trained in the Cognitive Therapeutics Method, an activities-based program designed to help seniors delay the onset of dementia. For more information on home care Harrisburg seniors and their families trust, call one of our qualified Care Managers at (717) 540-4663 to schedule a complimentary in-home consultation. Which Foods Can Help Prevent Diabetes?